Keltec KSG 12 Gauge shotgun | Gunz Inc.
« FN Five Seven on the way! In stock on 5/22/2015 Only one available at this time for $780.00. Get it before your friend does! 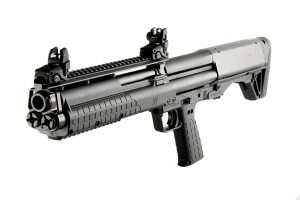 The KSG (Kel-Tec Shotgun) is Kel-Tec CNC’s first entry into the shotgun market. The size, shape, and design is similar to the currently available Kel-Tec RFB rifle, but the KSG ejects downward, instead of forward. The KSG weighs 6.9 lbs. and is as compact as legally possible with a 26.1” overall length and an 18.5” cylinder bore barrel. Even with this compact size, the internal dual tube magazines hold an impressive 12 rounds of 12 gauge 3” rounds in total (6 per tube). It can also reliably shoot shells as short as 1 3/4″ up to the 3″. Is Keltec KSG 12 Gauge shotgun still available? The KSG is still available and it’s calling your name, John.